Speaking about Italy and in particular about Rome, many people mention a great history, temperamental people, pizza, football and coffee. For breakfast, many locals prefer to taste croissants with a cup of espresso. When moving from one Roman landmark to another, it will be a perfect idea to become Italian for a few minutes and take several coffee breaks on your long and busy route – they will help to save energy and good mood for the whole day. 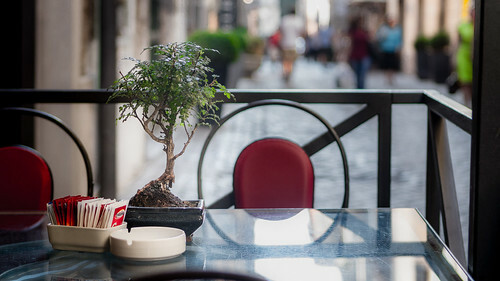 If you are in a hurry, go to any nearby cafe, and in case you want not only to enjoy the fragrant drink, but also plunge into a real Italian flavor, visit the following 5 coffee points of the city. For your convenience, check this site to rent a car in Rome, and you’ll find your favorite place for a coffee break hassle-free. Spring is the best time to sit on outdoor terrace of Caffé Strega. Chic straw chairs with tables stand along Via Veneto, and are sheltered from possible bad weather by wide tree crowns. Italian actors and directors often like to come there, so along with them you will see people with cameras who can sit in cafe for days, until good luck smiles upon them, and some famous person look there. Cappuccino is simply incredible there – it’s very thin and already sweet, so you don’t even think about adding sugar to it! For those who want to eat, we recommend traditional spaghetti and fish with vegetables. As for the service, it’s almost perfect. On the contrary, excessive courtesy is a bit annoying sometimes. 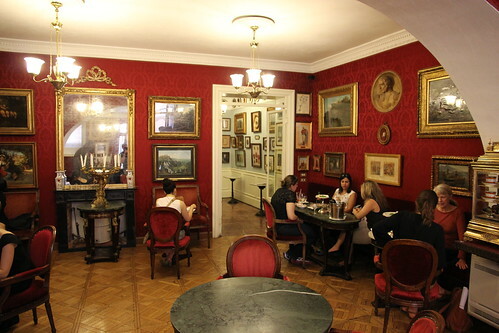 Café Greco is one of the oldest cafes in Europe, where Andersen and Goethe, once sat. Perhaps here the famous storyteller wrote his next fairy tale. The interior of the cafe is also appropriate – it’s decorated in the dreamy and atmospheric style of Belle Epoque. On the one hand from café you’ll see Spanish Steps, on the other – designer boutiques. While sipping a dark and strong coffee, you can meet the famous artist Stellario Bacheleri, who paints frescoes for the Vatican. The staff of Café Greco is incredibly delicate and tactful – it even seems that they capture even the thoughts of visitors. 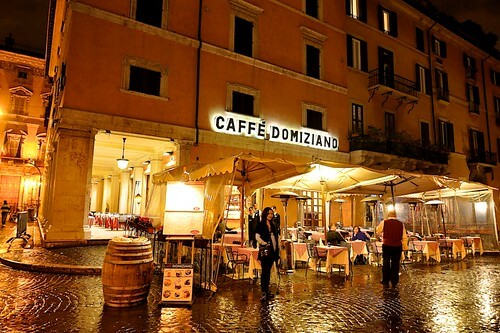 Cafe Domiziano is a typical example of how surrounding landscapes can positively affect the atmosphere and the process of drinking coffee. This place is located on the famous Piazza Navona, where Roman artists live, and the Fountain of the Four Rivers by maestro Bernini also has its beneficial effect on others. The most favorite choice of the visitors is noisette coffee, which is an espresso with the addition of a small amount of foamed milk. The name ‘noisette’ means hazelnut. This method of making coffee got its name because of the dark color. The owners of this establishment are very fond of offering their visitors cappuccino, with the addition of various ingredients, including alcohol. For example, Twist coffee is a blend of espresso, and egg liqueur. According to the barista, this drink will give you extra energy. The best choice: espressino coffee with whipped cream along with cocoa powder. 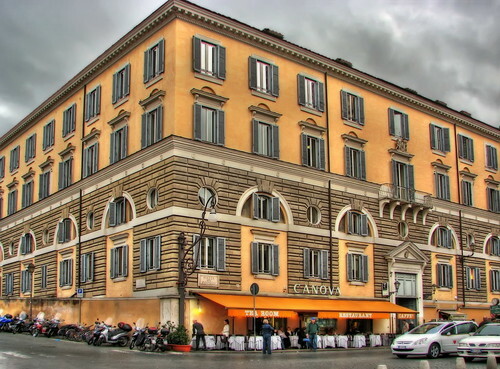 Cafe Canova is located on the most picturesque and impressive square of Rome – Piazza del Popolo. Now this is the place where the most important events happening in the country are celebrated. Perhaps that’s why the owners of Café Canova never had problems with visitors. In order to try what a real espresso is, in the mornings multinational queues are lined up there. Cafe is like a piece of country villa with an internal garden where lemons grow. For light snacks, we recommend you to try focaccia with onions and olive oil. The best choice: Bramante, which is a coffee with chocolate cream, powdered sugar and whipped cream. This is perhaps the only place in Rome where coffee will be served in high glass cocktail glasses. This is not pretentiousness or some kind of exotic, just a barista believe that coffee cocktails are better felt in such glasses. 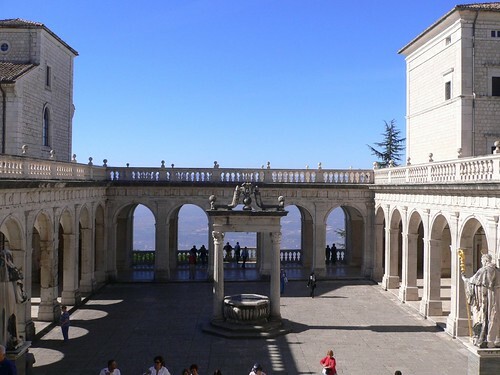 The cafe-bistro is located in Bramante Monastery, which is a place of rest and communication of the locals. The magnificent frescoes of Raphael, who once painted this monastery, are of particular value. This place often hosts various exhibitions that are open during the period of the monastery’s opening hours. Therefore, you can come there not only for breakfast, lunch or a cup of coffee, but also to discover the artistic value of this place. The generous menu is accompanied by very comfortable and unobtrusive service.